A reoccurring question I get is “what do you eat?” or “do you ever eat ice cream, or do you eat salads all the time?”…easy answer is yes I eat ice cream (my fav is Ben and Jerry’s Cherry Garcia) and no I don’t eat salads all the time, actually I eat salads on rare occasions. 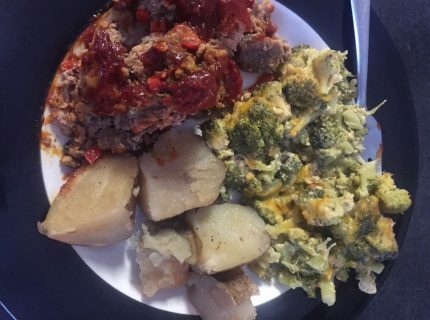 I do however try to get in a lot of veggies during the day, and I always want to enjoy my food. So read on to find out what fueled me up for a day! 8:00a: Coffee, Coffee, Coffee. I started my day off with one warm cup of coffee. In my coffee I put in some unsweetened vanilla almond milk and a drizzle of honey (~1 teaspoon). 9:00a: Breakfast. Smoothie with frozen cherries (~1 cup), frozen greens* (~1 cup) a scoop of chocolate collagen, unsweetened almond milk (~1 cup). Paired this with 2 hardboiled eggs sprinkled with Trader Joe’s Everything but the Bagel Seasoning (bomb!). 1:45p: Lunch. 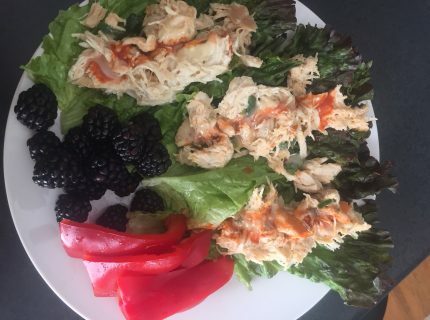 3 chicken salad lettuce wraps , big handful of blackberries and 1/2 red pepper. 8:00p Sweet Treat. 2 chocolate chip cookies. A friend came by and brought some homemade chocolate cookies which I gladly partook. its all about balance, and finding the balance that works for you and your goals. *Note: I usually buy a big bag of fresh greens every week (mixed, kale, spinach). I bring it home and put about 1-2 cups in several Ziploc bags a freeze. This makes it easy to throw in smoothies and other recipes. It also prevents your greens from going bad before you use them.